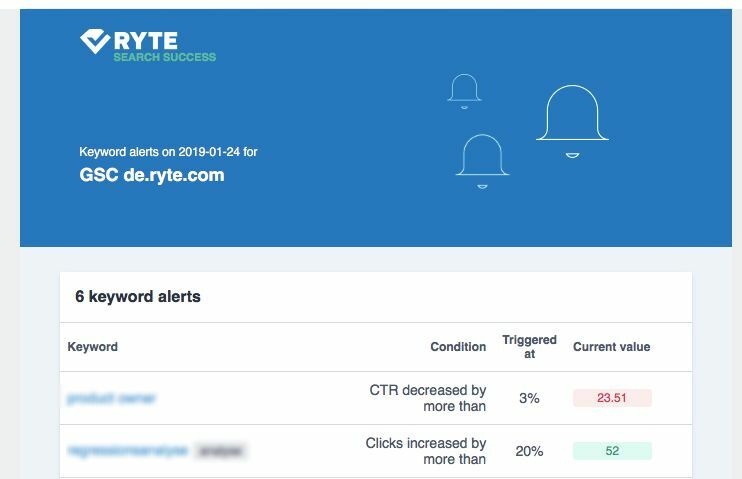 One of the most popular features in Ryte is the ability to choose certain keywords to monitor in the "Keyword Monitoring" report. 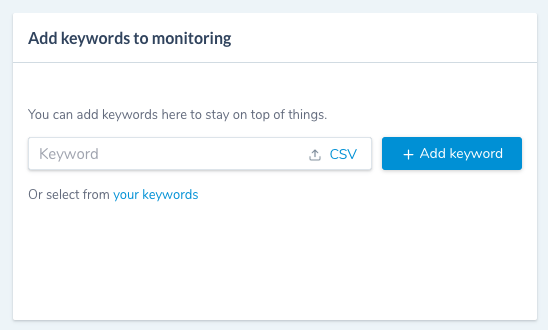 Now, with the new "Keyword alert" feature, it’s even easier to keep track of the keywords that are most important to your brand. Keyword monitoring is an integral part of a keyword strategy. You should be aware which keywords bring the most traffic to your website (this is easy to find out with Ryte search success), then you need to ensure that these keywords keep their good rankings. That’s where keyword monitoring comes in: monitoring the keywords that help users find your brand, therefore bringing traffic to your website. How many clicks and impressions do your keywords receive? What’s their CTR and position? How has their visibility changed over time? Monitoring the progress of your keywords over time can help you make decisions regarding your website content. For example, keywords with lots of impressions but a low CTR would be clicked on more often if the meta titles and descriptions of these pages were improved. If you’re familiar with Ryte, you will be aware of the keyword monitoring feature. You can add any keyword of your choice to the ‘Keyword monitoring’ dashboard so that you have an overview of the most important keywords for your brand, and how they develop over time in regards to clicks, impressions, rankings and CTR. You can add keywords to Keyword Monitoring either manually - just type in any keyword you want to monitor - you can choose from your Keywords in the Keyword report, or you can upload a csv file. To see changes, set a time period, and this will be automatically compared to the previous time period. You can also add labels to your keywords. For example, you optimized 10 meta descriptions on a certain date, and want to check how the CTR rate has improved since then. Add a label for the date you optimized, and filter according to the label. Or, for an online shop, you may want to group your keywords according to a certain category. In this case, add a label for that category. Keyword Alerts takes this keyword monitoring one step further. Keyword alerts gives you the option of receiving an email when a keyword metric of your choosing increases or decreases by an amount. To set up a keyword alert, firstly navigate to Keyword Monitoring. Once you have added a keyword to keyword monitoring, you will see a column for “alerts” with a notification sign next to each keyword. Click on the bell to be given options of adding alerts. You can add alerts for clicks, impressions, CTR and rankings. For example, here, I want to receive an email when the clicks for the keyword “Aida model” drop by 10%. If you choose the option “high sensitivity”, you will be alerted as soon as the value exceeds the threshold you have specified. If you choose “low sensitivity” you will be alerted when the weekly average exceeds the threshold you have specified. The alert is then triggered as soon as the clicks for this keyword drop by 10%. Then, I receive an email showing the condition (what did I want to be notified about), what this was triggered by, and the current value. Everyone who has access to the project will receive the email, unless you opt out of emails in the project settings. You can set 5 alerts per keyword. Using the keyword alerts function will make it even easier for you to monitor your most important keywords. It’s also a great way of keeping track of the keywords you have most recently optimized, and you can easily forward the email to colleagues with a list of instructions to make working in a team even easier. The feature is available to all users with at least a basic suite account. Unfortunately, free users do not have access to Search Success, but when you log into your account you can sign up for a free trial, giving you unlimited access to Search Success for one month. Published on 01/24/2019 by Olivia Willson.